The first snow of the season just hit the ski areas around Vancouver, British Columbia. While the slopes turn white this fall, the areas are abuzz with activity as crews hustle to finish projects that will improve the slopes for skiers and riders this winter. At [R284R, Mt. Seymour], more than $500,000 has been spent on improvements. The resort removed the old rope tow from the Goldie Meadows Learning Area and installed a covered 430-foot conveyer carpet in its place. Re-contouring the slope will also aid beginners in making their first turns. Mt. Seymour upgraded the beginner area by installing a new conveyor carpet. Photo Courtesy of Mt. Seymour. Other slope improvements at Mt. Seymour included the purchase of a new Bison groomer, upgrades to lifts and new lighting for night skiing. The rental shop traded in the fleet of ski, snowboard and snowshoe equipment for new gear. The ticket system has also been upgraded. [R127R, Cypress Mountain] has also been adding upgrades to the slopes. The snowmaking line on Panorama run was extended to include five more guns for more early-season coverage. The resort is also moving the Bell Power Park to Black Mountain to provide riders with faster laps on the Eagle Express. Lights were installed to allow the park to be lit for night use. 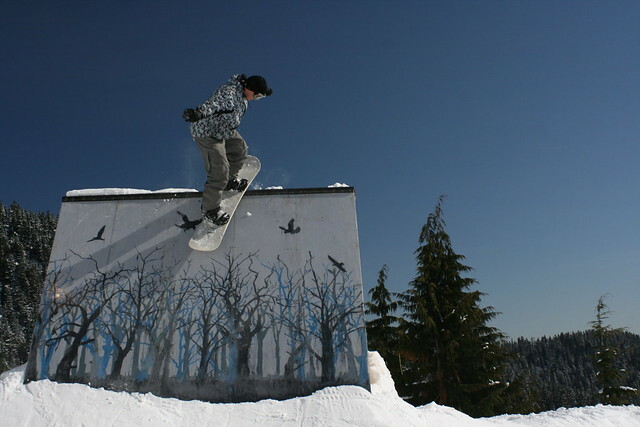 Cypress Mountain is moving their Bell Tower Park to Black Mountain. Photo Courtesy of JJ Koeman/Cypress Mountain. The hours for night skiing have been extended. The afternoon ticket can begin two hours earlier at 2 p.m. and the Night Owl ticket starts two hours earlier at 5 p.m. Both tickets are valid until closing, which is usually 10 p.m. The rental shop at Cypress also turned over its fleet. The shop now carries new HEAD skis and snowboards. [R163R, Grouse Mountain] also upgraded their slopes. Purgatory, a popular black diamond run, saw extensive work. Excavation improved drainage while brushing and thinning reclaimed parts of the run. Stabilization and reseeding reinforced the slope. Other projects included the construction of new features for the Quicksilver Terrain Park. The snowmaking system got overhauled, and one new grooming machine was added to the fleet for nightly slope maintenance. 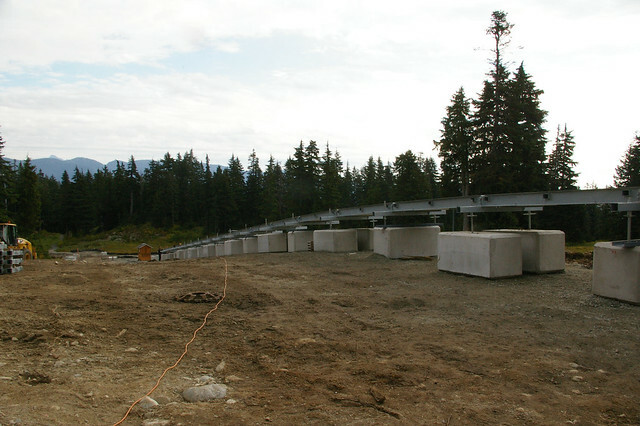 Grouse Mountain improvements include adding more features to the Quicksilver Terrain Park. Photo Courtesy of Grouse Mountain Resort. For non-skiers (or skiers looking for other adventures), Grouse is adding new snowshoe tours every Saturday and Sunday from 1-3 p.m. Private snowshoe tours for up to five people will be available, too. Grouse is also maintaining their private dual slalom course for business or group parties. Sixty racers can go head-to-head on the course. Gates and timers are provided along with ski instructors to give advice on technique. After-parties can include a catered lunch or dinner. Find out more information on the Vancouver ski areas here: Mt. Seymour, Cypress Mountain, Grouse Mountain.